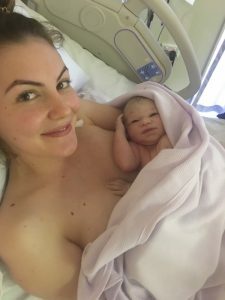 You are here: Home / Testimonials / Hypnobirthing really eliminated my anxiety and fear of birth! My birth was long but amazing and an experience I will never forget.. I was in labour for 30 hours, I do experience anxiety, so I was a bit anxious during my birth, however, when I was reminded to keep calm with each surge from my partner, mum and midwife, I dropped my shoulders and simply breathed through each one. At one point the pain just became too much for me and my body, and I felt like I needed some relief, so I did have gas and an epidural. My “birth plan” was to just go with the flow and if I felt like I needed pain relief, I wouldn’t make myself suffer without it. I dilated to 5cm on my own, which I am extremely proud of. And I birthed my baby, positively, with pain relief. I laboured for so long, however, it only took me 33 minutes to push my baby girl out! My midwife kept saying are you ready to push in an hour, counting down type thing, I wasn’t sure if I was ready, regardless I just told myself I had too and I have gotten this far and it’s just this little bit to go to meet her. For me, hypnobirthing really eliminated my anxiety and fear of birth. I was excited to give birth to my baby, and I couldn’t wait for it to happen once I hit 38 weeks. Hypnobirthing helped me incredibly just getting through my pregnancy, it can be difficult, especially that last month, you are so impatient! I listened to my hypnobirthing affirmations, had affirmations in my bedroom where I’d get ready every morning, if I got overwhelmed my pregnancy emotions I would even use my surge breathing, and I practised beating down every time I needed to go to the toilet! I love my birth experience, I didn’t have a set plan, just for it to be positive and for me to be happy, and my baby to come out healthy which is what happened. Thank you, Melissa, I will defiantly incorporate hypnobirthing in my future pregnancies/births, and I will even try to focus on using it more during my birth next time as well. This is our baby girl Arya!